Over the years little has been written about the remarkable life of Empress Menen Asfaw (April 3, 1891-February 15, 1962), who was the wife of the last reigning Emperor of Ethiopia, Haile Sellassie I. 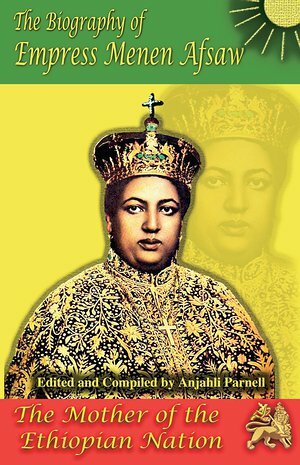 With this first time translation and publication of her biography, readers can become reacquainted with the life of Empress Menen and the great contribution she made to her faith, her nation and her family. The foundation for this biography is a rare book entitled, "Her Imperial Majesty Menen Asfaw" which was written shortly after her passing in 1962. The original book has been translated from the ancient Ge'ez language of Ethiopia to Amharic and then to English. To make this a true reflection of Menen's life, much has been added to the original manuscript including information about the history, culture and geography of Ethiopia, highlights of Emperor Haile Sellassie's reign, and periods in her life that were not well documented before have been expanded upon. There is also a brief description of the legendary story of the Queen of Sheba and King Solomon, as well as the Rastafari faith as many women across the globe view Empress Menen as an exemplary role model. There are sixty-two photographs, many not widely seen before, of the Empress and her family. The citizens of her nation knew Empress Menen for her kindness and humanitarian outreach. She established childcare centers and handicraft schools, as well as the Empress Menen School for Girls, the first of its kind to offer education to young women of Ethiopia. During the Italian Invasion of 1936-1941, she assumed the administrative responsibility of Ethiopia while the Emperor was on the battlefield. A woman of great faith, she was a member of the Ethiopian Orthodox Christian Church and constructed and upgraded many churches throughout her country. She visited the Holy Land four times and built a church and monastery on the banks of the Jordan River. During her life she also experienced a great deal of sorrow and hardship, enduring the loss of seven of her ten children, five years as a refugee of war in exile, plus the everyday struggle of on-going health problems. Empress Menen Asfaw, the Mother of the Ethiopian Nation, was a far-sighted woman well ahead of her time.